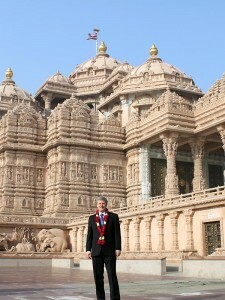 On Wednesday 18 November 2009, the Prime Minster of Canada, Right Honorable Stephen Harper, visited Swaminarayan Akshardham in New Delhi to experience India’s art, culture and values. 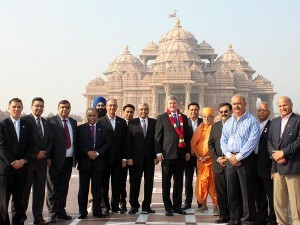 On behalf of His Holiness Pramukh Swami Maharaj, the inspirer and creator of Swaminarayan Akshardham and Spiritual Head of BAPS Swaminarayan Sanstha, BAPS International Convenor, Pujya Ishwarcharan Swami, welcomed the Prime Minister in traditional manner by applying a chandlo to his forehead, tying a nada chhadi to his wrist and placing a sanctified flower garland around his neck in a gesture of peace and friendship. During his one hour visit, the Prime Minster admired the Mayur Dwar (Peacock Gate) and the Gajendra Pithika (Elephant Plinth). Marveling at the beautifully carved stone elephants, Prime Minister Harper called upon Hon. Lawrence Cannon, Minister of Foreign Affairs, and other in the delegation to note the intricately carved stone texture of the elephants which seemed so realistic. The Prime Minster offered prayers for world peace and harmony and for the strengthening of Indo-Canadian relationships by offering ‘abhishek’, the ceremonial pouring of sacred water from 151 holy rivers, lakes and ponds across India, on the sacred image of Neelkanth Varni. Thereafter, the Prime Minister sat in the Sanskruti Vihar boat ride exhibition displaying 10,000 years of India’s glorious heritage. The Canadian delegation accompanying the Prime Minister included Hon. 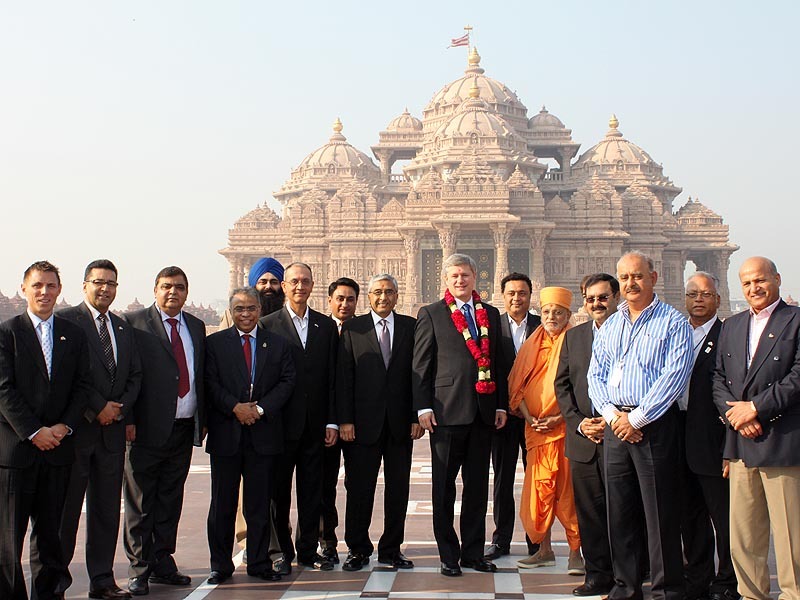 Lawrence Cannon, Minister of Foreign Affairs, five Members of Parliament: Deepak Obhrai, Nina Grewal, Patrick Brown, Devinder Shory and Tim Uppal, High Commissioners of both India and Canada, and leading Canadian businessmen of Indian origin.